works like a treat. really fun. a definite thumbs up on all firmwares and eloaders!! NOTE: Requires extra .WAD files (not included). Read the readme.txt after installation. Notes for this version: Added support for PSP SLIM. Rewritten Start Menu. Added information dialogs. Fixed multiplayer mode (4 players). Fixed animation of the mountains. 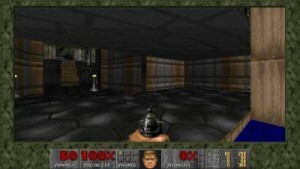 Choice of color of the character in multiplayer mode. Fixed a bug in the color of the character when they die. Correction of minor errors. Find download links for Doom PSP below.